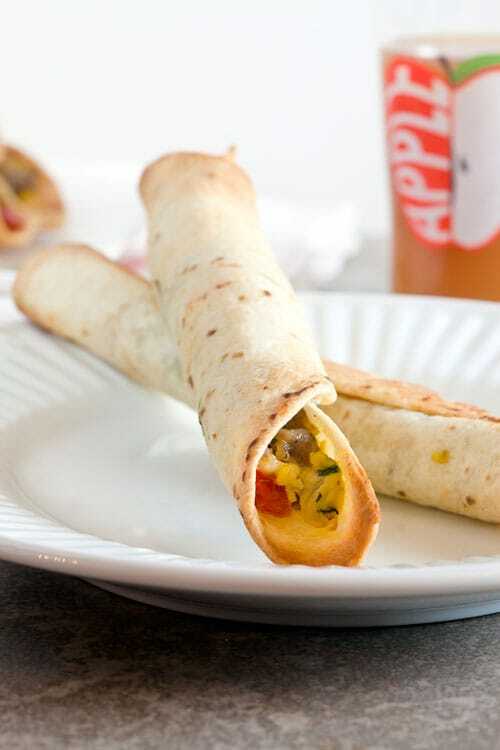 Baked Breakfast Taquitos | Healthy. Delicious. It’s not much of a secret around here that I’m pretty obsessed with baked taquitos. Over the past few years I’ve made a few versions, filled with everything from buffalo chicken to farm-fresh veggies. I’ve been meaning to make a breakfast version for a while, but I never got around to it – until now. It seems like out of nowhere the mornings are cold again, and I’ve found myself looking for a warm breakfast instead of my usual smoothie. Combine that with the fact that September is National Breakfast Month and, well, how I could I not make breakfast taquitos? This recipe makes servings than I usually go for, but it’s great because the freeze really well. Even better, they taste best after they’ve cooled off a little – which means I can bake them while I get dressed, wrap them up in foil, and eat them once I get to the office. 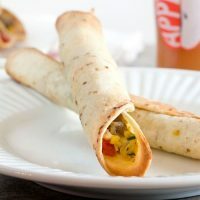 The filling options for these baked breakfast taquitos are limitless, but I was inspired by a Mediterranean omelet that I noticed on the menu of one of my favorite brunch spots recently. I started by browning a whole roll of Jones Dairy Farm all natural pork sausage. To the sausage, I added sautéed red onion, bell peppers, baby spinach, and soft scrambled eggs. Pesto, sundried tomatoes, and feta add tons of tangy flavor that goes perfectly with the sausage. I tried these with both flour and corn tortillas, they were both great, but Shawn and I agreed that flour was best since it didn’t overpower the flavor of the filling. If you prefer to make them with corn tortillas, heat the tortillas in a hot, dry pan for a few seconds to make them more pliable and help prevent them from breaking. Crumble the sausage into a large pan set over medium heat. Cook until browned and cooked through – 8-10 minutes. Remove from the pan with a slotted spoon and et drain on a plate lined with paper towels. Discard any grease that has accumulated in the bottom of the pan. Return the pan to the stove and add the onion; cook 3 minutes. Add the pepper and cook another 3 minutes. Transfer the pepper and onion to a bowl; mix in the spinach, sun-dried tomatoes, and feta. Whisk together the eggs and pesto. Scramble over medium heat until just set – about 5 minutes. Stir the vegetables and sausage into the eggs. Cut the tortillas in half. Spoon a heaping tablespoon of filling along the cut side of each tortilla; roll tightly and place seam-side down on a baking sheet. Repeat with remaining tortillas and filling. Lightly rush the tops of the taquitos with oil. Bake 10 minutes. Turn over and bake another 5 minutes. Freeze baked taquitos in a single layer until sold, then transfer to a freezer bag for longer term storage. To reheat, bake at 450ºF for 8 minutes. I created this recipe for my client, Jones Dairy Farm. Thank you for supporting the products that keep me inspired in the kitchen! Great breakfast on the go, idea, Lauren! I’m going to make up a batch of these to take next time we head out sailing early. I love your flavor combination! 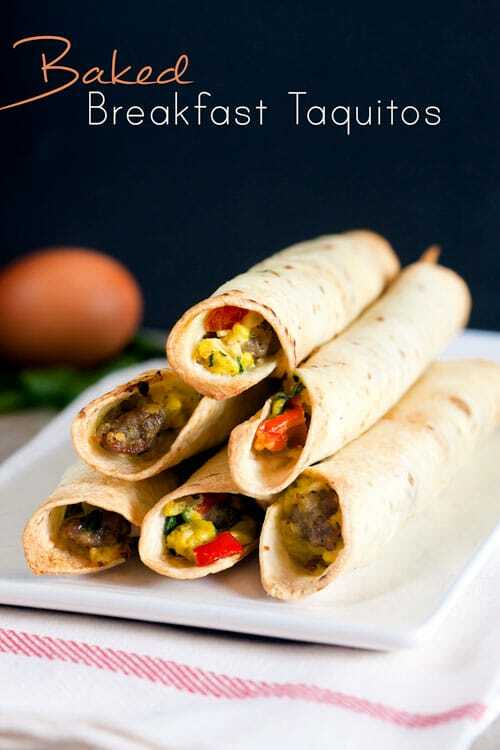 Love the idea of breakfast taquitos! My boys would love this! Oh these sound so good! Pinned! I love this idea to make to Taquitos into a breakfast item. You’re so smart! Where is my number 1 foam finger?! I am so down with these breakfast taquitos. They look delicious! I’m always looking for new breakfast ideas and this is awesome! Yay, something different for breakfast. And it’s baked Taquitos to boot. I never thought of doing something like this. Well none. 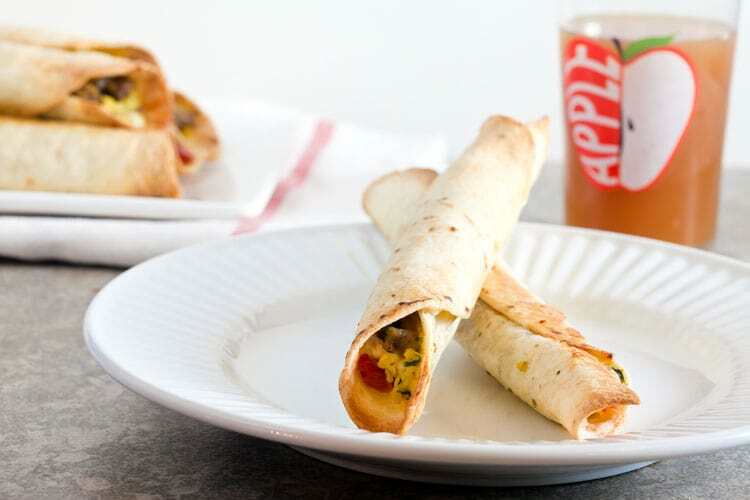 Love the breakfast twist on taquitos! I’ve done breakfast enchiladas but never thought to do taquitos before. Great idea! Baked – I’m all over it, so much healthier and they taste better too. I buy frozen ones. I need to get out of that habit!!! So glad you posted this!! I bet these would be great for make ahead breakfasts for the week to grab n go! These look great! I need to make these for those quick-out-the-door mornings! These are so cute. Perfect grab n go breakfast! I love taquitos but have never thought to make them for breakfast! Love these!